Definition at line 145 of file llalertdialog.h. Definition at line 148 of file llalertdialog.h. Definition at line 150 of file llalertdialog.h. References mDefaultOption, mOptionDefaultText, and mOptions. Definition at line 160 of file llalertdialog.h. References FALSE, LLControlGroup::getWarning(), mIgnorable, mIgnoreLabel, and LLAlertDialog::sSettings. Definition at line 172 of file llalertdialog.h. References mIgnorable, mIgnoreLabel, LLControlGroup::setWarning(), and LLAlertDialog::sSettings. Definition at line 192 of file llalertdialog.h. Referenced by addOption(), LLAlertDialog::LLAlertDialog(), and LLAlertDialog::parseAlerts(). Definition at line 193 of file llalertdialog.h. Definition at line 189 of file llalertdialog.h. 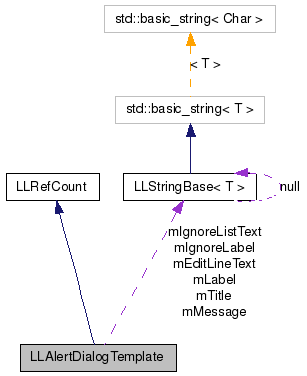 Referenced by getIgnore(), LLAlertDialog::LLAlertDialog(), LLAlertDialog::parseAlerts(), and setIgnore(). Definition at line 186 of file llalertdialog.h. Definition at line 185 of file llalertdialog.h. Definition at line 182 of file llalertdialog.h. Definition at line 184 of file llalertdialog.h. Referenced by LLAlertDialog::LLAlertDialog(), and LLAlertDialog::showCritical(). Definition at line 187 of file llalertdialog.h. Definition at line 191 of file llalertdialog.h. Definition at line 190 of file llalertdialog.h. Referenced by addOption(), LLAlertDialog::LLAlertDialog(), and LLAlertDialog::showCritical(). Definition at line 183 of file llalertdialog.h. Referenced by LLAlertDialog::LLAlertDialog(), LLAlertDialog::parseAlerts(), and LLAlertDialog::showCritical(). Definition at line 188 of file llalertdialog.h.